Al-Futtaim Group and Emaar have planned a joint venture to develop an $819 million multi-use complex in the heart of New Cairo. will create a trendy lifestyle for the community of New Cairo, as well as a prominent tourist destination for travellers around the world. The developers hope the creation of Egypt’s mega-mall development will assist in the economic growth of the country. 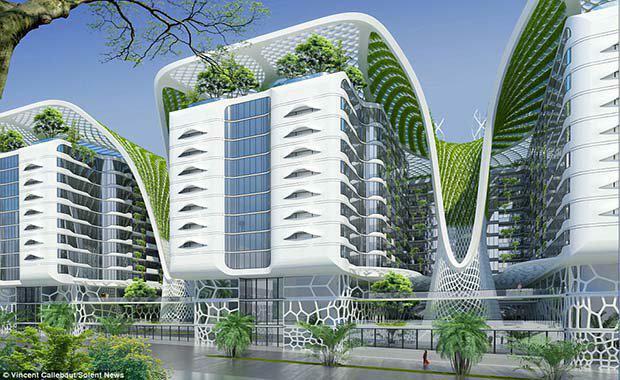 Vincent Callebaut Architecture has unveiled the design for the multi-use complex in New Cairo. A mega shopping mall will be the centrepiece of the development, however the complex will include an office, parks, a luxury hotel, schools, medical facilities and residential areas of town houses, villas and apartments. The ambition of the Gate Project is to create a new prototype of inhabited ecosytem that will create 50 per cent energy savings. The building is also designed to decrease its carbon footprint, and to recycle a part of its own waste, for example. Mr Callebaut said the main objective behind this urban proposal is to raise awareness of green sustainable architecture to fight against global warming. ‘The project shows a high ambition in green energy and technology. The objective is to create a sustainable landmark in Cairo by transforming this efficient building mass, multiplying the perspective views towards the streets, into a huge urban oasis." The complex will feature solar roof, green terraces, sky villas and green cascades falling in each courtyard. The rooftop forms a community rendezvous spot and common playground area with food gardens, orchards, infinity swimming pools, and sports areas. The joint venture of The Gate Residence development will deliver a lifestyle and entertainment precinct on 160 acres of land on the Cairo-Alexandria Desert Highway. The Gate Residence will consist of a one-kilometre frontage along the Cairo-Alexandria Desert Highway, which will complement the residential, commercial and hospitality components of the development. The first stage of The Gate Residence development will comprise of the construction of the mega mall with leasable area of 120,000 square metres. The mega mall will be anchored by developer Al-Futtaim’s retail brands including the iconic IKEA, Marks & Spencer, Toys “R” Us, Ace, Intersport, Guess and Esprit. The future stages of the development will include the residential component which will cover 131,082 square metres of land, in the heart of New Cairo. The Gate Residence, situated in the prime position, surrounded by numerous retail, hospitality, health and fitness precinct, is in one-kilometre radius to the new AUC campus. The residential living component of the complex is aimed towards young adults, under- and postgrad students, as well as young families. The Gate Residence, will be a hyper connected ecosystem to help fight global warming. The complex will integrate various forms of renewable energy – photovoltaics, wind turbines, geothermal energy and biomass – to reduce the carbon footprint. The roof of the complex will integrate the traditional Egyptian architectural design, wind catchers to stimulate natural passive cooling. Wind catchers function in numerous ways including directing airflow using direct wind entry, using wind-assisted or solar-assisted temperature gradients to direct airflow. Al-Futtaim Group and Emaar have large developments in Egypt, however the Cairo development will be a marking milestone, contributing towards growing the Egyptian economy. Emaar Misr is regarded as one of the largest real estate developers in Egyptian real estate market with investments of EGP$ 31.67 billion. The Gate Residence will be started in March 2015 with an expected completion date of 2019.